When I was in the Philippines, I would buy “taho” almost everyday for breakfast. It is composed soft tofu, mixed with syrup and tapioca pearls or “sago” (optional). It’s rather cheap in Angeles City, where you can get a 200 ml. glass for only five pesos. Loved it from when I was young. Here in Korea, I can prepare “taho” easily. 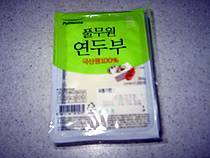 There are three different kinds of tofu available in Korean markets. You can buy them firm, medium or soft. The first two are square in shape while the soft one is sold in a tube. 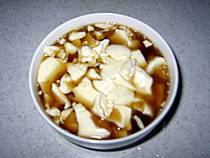 You can use either the medium or soft tofu when making “taho.” A 300 gr. pack can be had for 600 KRW (US beans) or 1,000 KRW (Korean beans). I usually buy the medium tofu for my “taho.” I just boil or steam it in water for a few minutes and drain. Then I prepare the syrup by boiling 1/4 cup of brown sugar with an equal amount of water until it’s syrupy. Others would half the amount of water for the syrup but I just don’t want it too sweet. Add the syrup to boiled “tofu” and mix. Voila! Instant homemade “taho” in Korea! i like the one that comes in tubes. haaay..homesick na naman! Hey betchay! na-miss ko ang taho! thanks for the recipe! I agree that he homemade taho doesn’t look as good as the real taho we get in Manila. But if you are far from home, it’s the next best thing. Right? Sorry but this is not really how to make homemade taho. It should be IMPROVISED TAHO. Found a step by step post on making homemade taho from scratch. Oh! I’m so glad that we have all kinds of tofu here in Korea. I can make IMPROVISED TAHO easily. Thanks for the link!